Bill Hobbs has a thoughtful and fact-filled post discussing John Kerry's emphatic opposition in Thursday's debate to ongoing American development of nuclear bunker busters, a/k/a "Robust Nuclear Earth Penetrators." Bill's post has quotes from the debate, details about the research program, and an eloquent explanation for why it's an appropriate tool to add to America's arsenal even if it's never used in combat. Among the points made there is that if such a weapon is part of our arsenal, its very existence will help ensure that it need never be used — even general knowledge of its capabilities being likely to deter terrorists or their state sponsors from making the massive investments in underground bunkers that might not be destroyable by advanced conventional (non-nuclear) munitions. [I]f the Cold War ever went hot and Soviet tanks rolled over the barbed-wire fences and minefields marking our sector of the border, the dark pines of the Böhmer Wald would have erupted with nuclear explosions. That was a prospect that could keep a twenty-seven-year-old captain awake nights — and it did. The prospect of America using nuclear weapons today is a subject on which just about everyone is hypersensitive, for entirely understandable reasons. Some substantial portion of the public — which includes, but is not limited to Sen. Kerry's political base — simply could not read Bill Hobbs' post without immediately dismissing him and the sources he cites and quotes as being crazed Dr. Strangelove-types. Of course, such people would find that their scruples and moral outrage wouldn't shield them for even a milisecond longer than anyone else if the terrorists who want to destroy civilization ever succeed in acquiring a nuke, no more than the sensitive liberals atop the World Trade Center towers suddenly grew parachutes while the floors beneath them dissolved in flame and rubble. But I acknowledge that there are people who are simply unable to have a serious discussion about nuclear weapons, whether they're in the hands of a terrorist or of an American soldier like Tommy Franks acting under layers of control running directly to the President of the United States (whether that continues to be George W. Bush or becomes John F. Kerry). If you're one of those folks, though, you might as well find another link to click, because at this point, my post is about to take a strange detour — one that explains, eventually, my own particular perspective on nuclear weapons. Upon graduation from the University of Texas in 1944 via an accelerated Naval Reserve Officer Training Corps program, James D. Dyer, Jr., a 1941 graduate of Lamesa High School in tiny Lamesa, Texas, was commissioned as an Ensign in the United States Naval Reserve and immediately placed upon active-duty status. 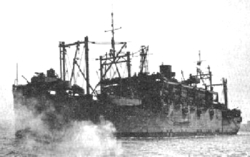 Shortly thereafter, he was assigned as a junior officer aboard the Amphibious Attack Transport USS Zeilin, pictured below. The Zeilin was named after Brigadier General Jacob Zelin, a hero of both the Mexican-American and Civil Wars and, as the Seventh Commandant of the Marine Corps, responsible for the adoption of the Marine Corps' eagle-globe-anchor emblem in 1867 and The Marines' Hymn. With Ensign Dyer among its officers and crew, the "Mighty Z" steamed out of San Francisco for the western Pacific on 21Oct44, and in December participated in practice landings at Guadalcanal in preparation for the invasion of Luzon. 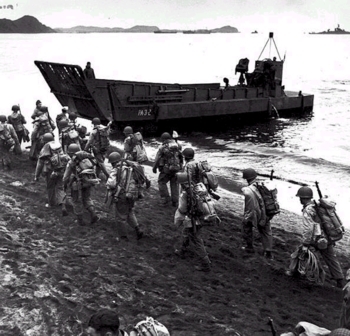 On 11Jan45, she landed troops as part of the first reinforcement echelon for the San Fabian phase of the invasion. Today we met our first Kamikaze. "On Target" I yell and Frank yells back "On Target". But there are over fifty ships scattered on the sea behind us, men on some of those ships already killed by friendly fire — maybe from our after guns. No. 1 gun stays silent and for just a few seconds time slows in horror as the plane streaks across the few hundred yards of water and slams into a gun tub on the sky deck of the USS Zeilin (APA-3) just off our starboard quarter. In a blink of an eye, lives are snuffed out, winking into blackness like candle flames in the wind. For a few minutes, flames seem to envelop the entire ship, subsiding almost immediately to nothing more than charred, smoking wreckage in the twisted scorched gun tub. And through it all the Zeilin never slowed, never changed course, never lessened its intent of destruction upon the enemy. I looked across the breech of the gun at Ambrutis and he just shook his head. The Zeilin suffered seven killed, three declared missing, and thirty wounded. But she continued onward with her convoy, and after temporary repairs, she participated in landing reinforcements at Iwo Jima between 9-16Mar45. After permanent repairs back in San Francisco and a brief stop in San Diego, she headed back to the western Pacific, and was at Eniwetok in the Marshall Islands when hostilities ended in the Pacific on 15Aug45. As the only Texan among the Zeilin's junior officers, young Dyer was of course nicknamed "Tex." In due course, he'd been promoted to Lieutenant (Junior Grade). Among his duties was commanding boats like the Landing Craft, Mechanized from the Zeilin pictured below, or even smaller boats like Landing Craft, Vehicle, Personnel. Just as troopships like the Zeilin were favorite targets for kamikaze pilots and submarines, junior officers commanding LCMs and LCVPs were favorite targets of Japanese snipers. (Recall, if you've seen it, the opening scenes from Saving Private Ryan — same boats, albeit in a different theater of operations.) If Harry Truman hadn't decided to use America's new atom bomb to bring World War II to a close in August 1945, young LTJG Dyer's odds of surviving the planned invasions of the Japanese mainland were, realistically, poor. "Tex" Dyer very possibly, perhaps even very probably, wouldn't have returned to Lamesa, Texas, in 1946; wouldn't have married; and wouldn't have had his third child in 1957. And you wouldn't be reading this particular blog. Although the Cold War is over, and the risks of global thermonuclear war and mutually assured destruction have lessened, any American president — of either political party — is going to be extremely reluctant to use nuclear weapons, of any type, in any but the most compelling circumstances. But since 9/11, compelling circumstances that previously seemed unimaginable, aren't anymore. No one but a deranged barking moonbat would argue that America should pursue complete and unilateral nuclear disarmament. So who else — besides the terrorists and their state supporters — would we be doing a favor by cancelling the nuclear bunker buster program? 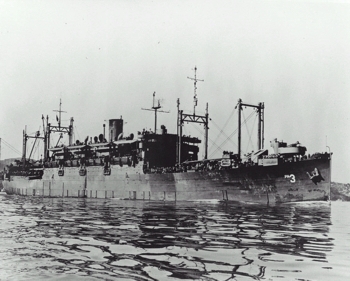 The USS Zeilin was decommissioned in 1946, and scrapped in 1948. But LTJG (ret.) James D. Dyer, Jr., now age 83, still lives in Lamesa, Texas; his Naval Reserve Identity Card from 1946, wrapped in plastic, is still in his wallet. His grandchildren, including my four kids and my four nieces and nephews, have seen that same photo of the Zeilin that appears above in this post hanging inconspicuously on the wall of his garage when they've gone to see their G-Pa on many a Christmas. I hope that he'll be able to himself, but even if not, I'd like someday to be able to show my own grandchildren that photo of the "Mighty Z" someday, and tell them about their great grandfather. An American ability to take out an otherwise impregnible underground terrorist bunker seems to raise that probability in my admittedly biased but sincerely felt judgment. So yes, I'm for this program; and the fact that Sen. Kerry's against it is yet another reason I'm against him. Although I never saw her — and although I've learned more about the action she participated in from research done on the internet than I've ever been able to pry out of my dad — I still remember the Zeilin. It seemed to me that we were doing a lot of aimless driving, and I was frankly pretty bored. But I remember being surprised when we pulled up to the main gate of the San Diego Naval Station. A crisply uniformed and armed sailor (or maybe a Marine; I didn't know the difference) stepped to my dad's driver window to inquire about our business. My dad winked and dug out his wallet, then produced a faded card from deep within it (although I had no idea what it was). I remember seeing the guard's eyes widen when he looked at it, and then he politely asked us to wait while he went back into the guard station to make a phone call. He stepped back to our car in a moment, handed my dad back his ID, motioned to his fellow guard to raise the road baricade, and invited us to take a driving tour of the base (with a polite warning not to leave our car and to stay on marked roads). My sister and brother and I looked at each other in stunned amazement. But then something happened that completely dropped our jaws: the guard stepped aside and snapped off a precise, very respectful salute. "Enjoy your tour, Lieutenant Dyer," he said, and then he executed a smart about-face and returned to his post. I shut up about the chrome grill for the rest of the day. Update (Sat Oct 2 @ 9:45pm): Hugh Hewitt's hosting a virtual symposium on the subject of Kerry and bunker busting nukes, with links galore. Reading *Unfit for Command* and *Tour of Duty,* along with viewing him from Massachusetts as a senator, I've concluded that Kerry is mainly a pacifist. It is clear that he left Yale and joined the Navy to avoid the draft. He went to Vietnam with an anti-war position and returned to slander the mostly good warriors of the Vietnam War. His Senate record on issues of weapons confirms his essential pacifism. He, occasionally favors this or that war or weapons program to cover his left flank.Should Kerry be elected, he would be very weak in defense and diplomacy, probably outdoing even Jimmy Carter. Kerry is essentially a phony war hero who slandered the mostly good Vietnam warriors and has proven to have a quite thin Senate record. He is descended from the Winthrop and Forbes families but has little of their integrity. Thank you for your wonderful post about the USS Zeilin. I printed a copy of your post for my father, who was a young Marine sergeant when he made the blitz on Okinawa. Following the end of hostilities on Okinawa, he was sent for R&R and training to prepare for the landing on one of the main islands of Japan. They anticipated one million American casualties. I think we are grateful for the thing. You should get and read, if you haven't Paul Fussell's Thank God for the Atom Bomb. It's a masterful defense of Truman's actions. I just want to thank you for sharing something so personal. So when are we going to see a book from you? As one of your biggest fans, I feel a literary work from you would be well received. My father - Vincent Percich - was a member of the 41st Infantry Division in the second world war. He fought through New Guinea to the Philippines. As a combat engineer, he was scheduled for the first wave in the amphibious landing planned for Kyushu. During the late 1960s and early 1970s, he would always watch the CBS Evening News on 6 August and 9 August and grumble about people who just didn't understand. Being his son and infinitely smarter than Vince at the time, I would lecture him about how bad neclear weapons were. He would ignore me and go for a walk. In the last 1980s and early 1990s, I would periodically go down to the Pentagon library and read the campaign histories of the 41st Infantry Division. I would read about the Marines and the Army division on Okinawa. I read open literature histories in which invasion planners estimated 500,000 American dead and 3,000,000 Japanese dead for the invasion of Japan. After 26 amphibious invasions, Vince Percich was pretty sure that he was not going to make it through Japan. Within 45 days of the Hiroshima, he was heading home to Warren, OH to produce me, my sister, and my two brothers. Whenever I hear Kerry (or someone like him) whine about nuclear weapons, I think about life in the 41st Infantry Division and say the magic words - Thank God for the Atomic Bomb. I hope that it works like a talisman and keeps the Kerries of the world away from the Presidency. We already won the nuclear arms race. Why start up a new race? Kerry is right that this bunker busting nuke sends the wrong message. South Korea admitting to their nuclear program years ago also sends the wrong message, no matter how lame the progress was. Why give Evil regimes excuses they can give to their people to go hogwild with nuke production? People who support this are either crazy or who make money by being a defense contractor. Goober, why am I almost certain that you didn't read my post or Bill Hobbs'? "Evil regimes" need no excuses because  duh!  they're evil. They're not in an "arms race" with us  the question is not whether they can compete with us in numbers of nuclear weapons or delivery systems, and indeed, they don't need to. Like all terrorists, they rely not on numbers and distribution of their weapons to create an ability to survive a massive nuclear strike or counterstrike, but on our humanity. Dem Sens. Kerry (MA), Edwards (NC), and Graham (FL) were not present to vote. Dems voting with the 56 in favor of tabling the amendment were Sens. Lieberman (CT), Breaux (LA), Miller (GA), Bayh (IN), Nelson (FL), and Nelson (NE). Republican Sen. Chafee (RI) voted against tabling, as did "Independent" Sen. Jeffords (VT). Goober, you couldn't be more wrong. The only thing at all that restrains regimes like the Soviets and North Korea from acting is the threat of direct consequences for the leadership. During the Cold War the Soviets faced the problem of having to wiped the bulk of US population to win. Otherwise they'd face an ongoing meat grinder of guerilla assault fromt he well armed remnants of the nation even after the military had been conquered. We're talking about a causalty rate that would exceed our own in Iraq by several orders of magnitude. This would be extremely hard to sustain with a conscript army. OTOH, to take out the Soviet Union as a nation we only had to kill a few hundred individuals, fewer than a thousand. Without those masters at the top the greater population has no motivation to continue acting as if they're under the gun to obey. Quite simply, if an American doesn't show up for work he may lose the job but he isn't going to sent to a gulag as a result. It is meaningless to threaten the leadership of regimes like NK and Iran with the deaths of vast numbers of their citizens. It isn't as though they weren't killing plenty of those same people already. The only threat with any genuine meaning to a dictator is a threat to his personal safety. Bunker busters are a critical factor in our ability to offer that threat. My own father went through boot camp at Ft. Dix just in time to be deployed for the occupation of Austria. He was pre-med but after being pressganged as a surgical nurse on several occasions he decided to change majors. Even after being sent to Europe the thought that dominated the minds of every young soldier was the continuing battle for the Pacific. The horrific causalty rates of that theater were well known to all, as was the intensity of determination the Japanese were display in the face of hopeless odds. There was no doubt Japan would be defeated but the expectation all around was that the cost in American lives would be terribly high. So yes, the annihilation of two cities, civilians and all, came as the best of news. War does that. When the only option offered is death on a massive scale you can only hope to make the tally marks fall on your opponent's side of the board. One thing many opponents of the WWII atomic bombs fail to consider is what would have ultimately happened to Japan when it was finally conquered by a force that had left huge numbers of itself dead or maimed along the way. To say that the invaders would be in a bad mood is like comparing a 30 Watt light bulb to a H-bomb. IMHO, Japan as a nation may have ceased to be be for all time. Great post. Thanks. Me dad was a railway engineer. His unit attatched to Patton's 3rd Army. Which he never told me until I asked him for more details of his service. So I now get to tell people (brag) about my father's work to support, to resupply, our glorious 3rd Army of General Patton. Thanks for that wonderful story, Beldar. It seems that your dad is typical of so many of the men who served heroically in our armed forces, reticent to talk about it. The real heroes didn't brag about what they did. John Kerry, however, did. Enough said. served on the AKA Arcturus, went through the hell of the Okinawa landings when the kamikazes massacred ships to his port and starboard, and was assigned to Olympic. But he came home, and I have a younger brother and sister (both, alas, pacifists and Kerry supporters). Give your Dad a salute in honor of a departed comrade, and in honor of my uncle Albert Oberg, USNA '42, LTJG on DD Strong, that went down in Kula Gulf in the Solomons on July 5, 1943. He got to be 22, and no further. Never friggin' FORGET. Please thank your father for me. I cherish the freedom and peace my family is blessed to live in, because of men like your father. I agree with your conclusion. It is the same one I've come to. Sen. Kerry's record as a senator indicates that he is a pacifist. I also think that he is an isolationist, albeit the kind that wants to keep America home in order to protect the world from America. Based upon my reading of history, I find pacifism and isolationism to be morally repugnant and practically useless. Morally repugnant because you won't lift a finger to stop evil and will let others carry your burden so that your hands don't get stained. Practically useless because evil people aren't impressed by your stance, rather it just encourages them to continue. "The Guy Who Relaxes is Helping the Axis"
...what could be more appropriate for the Massachusetts Gigolo Surrender Monkey?